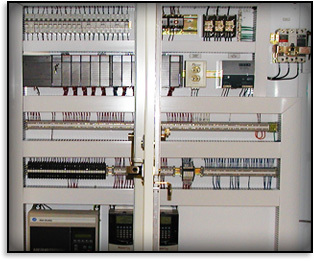 Electrical Techniques, Inc. is an Industrial Electrical/Mechanical Fabricator in Northwest Arkansas. We offer Electrical and Mechanical solutions tailored to your specific environment. E.T.I. can assist with issues ranging from PLC programming to Machine Installation, Demolition or Relocation. Electrical Techniques, Inc. was founded in 1988. In May of 2000 we expanded our scope by launching a Systems Integration Division to provide the best cost-effective automation systems for industry. Our Mechanical Leadership has been in the industrial arena in Northwest Arkansas since 1972 providing effective solutions to mechanical problems. E.T.I. has 20 plus year’s worth of experience solving industrial automation, power and control problems with innovative and state of the art solutions. E.T.I. will work with you to determine the best solution for your situation. E.T.I. offers Electrical, Mechanical and Programming support. E.T.I. performs complete Turn-key Projects, as well as Emergency Assistance to clients in the Manufacturing Industry. Our expertise has been gained through projects both large and small. You can be assured that your project will be completed both On Time and On Budget. We will confirm your quote request within one business day.